Dungannon condemned Warrenpoint to a 12th straight Premiership defeat in a one-side basement battle. Daniel Hughes gave Town an early lead but the Swifts seized control and Paul McElroy levelled with an own goal. Keeper Aaron Shanahan turned Kris Lowe's shot into his own net before McElroy fired in to make it 3-1. Andrew Mitchell added the fourth before Cormac Burke scored his first Swifts goal as the hosts moved 10th while Town are seven points adrift at the bottom. 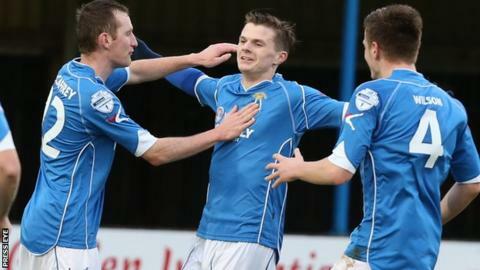 It was a first home league victory for Dungannon in over three months and takes them above Carrick Rangers. Dungannon Swifts head coach Rodney McAree: "I'm absolutely delighted - it was a deserved win and the three points gives us a bit of a lift. "It wasn't a good start but the boys responded well and young Kris Lowe was phenomenal for us." Warrenpoint Town manager Barry Gray said: "We were lacklustre, embarrassing at times and brought nothing to the fixture. "Credit to Dungannon but we can't afford to waste time on players that want to waste time."